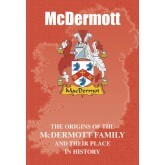 Two separate branches of the McDermotts flourished for centuries in Ireland, and both contributed significantly to the rich tapestry of the island’s history. While some of the name enjoyed glorious fortune, other suffered tragic misfortune in the cause of the nation’s freedom and independence. In more peaceful times, Gilbert Hastings McDermott, born in London in 1845, and known as ‘the Great McDermott’ was the music hall manager who found fame as the singer of ‘T..
Not only fearsome warriors but also distinguished poets, the McGraths were from earliest times to the fore during many key episodes in Ireland’s turbulent history. Their lineage is illustrious, while many paid a costly price in death or exile in defence of their nation’s freedoms. The proud tale of the McGraths is told here. NAME variations include: Mac Craith (Gaelic), Grath, MacGra, MacGrath, MacGraw, McGraw, Magrath, Magraw. ..
Ulster, which along with Connacht, Munster and Leinster is one of the four ancient provinces of the Emerald Isle, is the original territory of proud bearers of the McGuigan name. It was from present day County Tyrone, allied with other proud clans such as the O’Neills and the O’Donnells, that the Ulster clan embarked on one of the bloodiest rebellions in the island’s history. 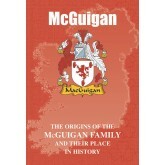 The stirring tale of the McGuigans is recounted here. 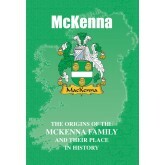 NAME variations include: Mag Uiginn (Gaelic), MacGuigan, Ma..
How the McKennas came to hold sway for centuries in an area in the north of present day County Monaghan is a tale infused with Celtic romance. In common with many other native Irish clans, they were doomed to virtual extinction in the wake of oppression and tyranny and the struggle for freedom and independence – but their proud heritage is still very much alive. Read here the inspiring saga of the McKennas. NAME VARIATIONS INCLUDE: Mac Cionaoda (Gaelic), Mac Cinna (Gaelic), Mac Cionnaith..
Two important septs of the McLoughlins and their various namesakes flourished for centuries – in the province of Ulster and the ancient kingdom of Meath. What they both had in common, and their descendants scattered across the globe have today, is a pedigree that stretches back to one of Ireland’s legendary heroes, the gloriously named Niall of the Nine Hostages. 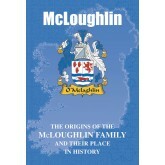 Read here the thrilling tale of the McLoughlins. NAME variations include: MacLochlainn (Gaelic), Ó Máoilsheáchlainn (Gaelic), .. In the far north of Ireland they flourished as the McMahons of the Kingdom of Oriel, while further south they were proud holders of the title of Princes of Thomond. Although separated by distance they both could lay claim to distinguished lineages, while also proving resolute in defence of their ancient rights and privileges. Read here the stirring tale of the McMahons. 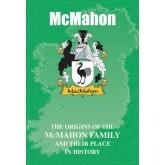 NAME variations include: MacMathghamhna (Gaelic), MacMahon, Mahon, McMahan, Mahan, Mann, Maughan. ..
Found from earliest times in two of Ireland’s ancient provinces, bearers of the McManus name found themselves at the very heart of the island’s frequently violent episodes. Resisting attempts to stamp out their very identity as a Gaelic-Irish clan, they paid a bitter price, and many were forced to seek a new life in foreign lands where their descendants thrive to this day. 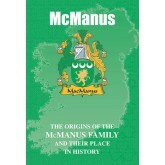 In contemporary times and on the screen Mark McManus, born in South Lanarkshire in 1935, wa..
With sword and pistol in hand, the ancestors of the McNamaras of today were for centuries at the very heart of the turbulent drama that is Ireland’s history. Proud of their heritage and resolute in the defence of their ancient rights and freedom, many paid dearly for their defiant stance. Read here the stirring and colourful tale of the McNamaras. NAME VARIATIONS INCLUDE: Mac Conmara (Gaelic), MacNamara, Macnamara. ..
Three distinct groupings of bearers of the surname Moore, in all the rich variety of spellings of the name, came to be settled in Ireland. But despite their different origins they all shared in making a significant contribution, not only to the island’s history, but also to that of those nations in which their descendants later settled. 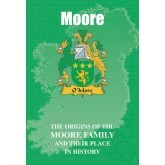 The colourful and stirring tale of the Moores is recounted here. NAME variations include: Ó Mordha (Gaelic), O’Moore, O’More, Morey, Moor, More, Muir. 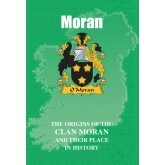 ..
Bearers of the Moran name can be proud of a rich and vibrant heritage that stretches back to Ireland’s earliest kings and warriors. Embroiled for centuries in many of the island’s bloodiest conflicts, they nevertheless survived to make their mark through much more peaceful pursuits. In the world of entertainment, Dylan Moran is the award-winning Irish comedian, actor, writer and filmmaker whose British television sitcom Black Books won two BAFTA TV Awards for Bes.. 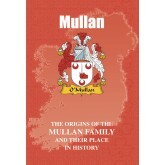 In original Gaelic forms that include Ó Maoláin, bearers of the Mullan name and its numerous variants have been present in Ireland from the very earliest times. Tracing a descent from the mysterious tribe known as the Tuatha De Danann, their pedigree is infused with myth and legend, while many have achieved high honours and distinction through a number of pursuits and endeavours. In sport, and described as a legend in the world of horse racing following his death.. It may rank as one of the most common Irish surnames, but there is nothing common about the exploits of bearers of the proud name of Murphy both in Ireland and much further afield. Tracing a descent from the warrior kings of Leinster, they have played a key role at pivotal points in Ireland’s turbulent history, while others have flourished at both home and abroad through a rich variety of pursuits. On the stage, Eddie Murphy is the American actor and comedian who..
With a history stretching back to roots firmly seeded in the rich soil of the Emerald Isle, the Nolans of today can lay claim to an illustrious pedigree and heritage. One of their distinguished ancestors is an Irish hero of truly mythic proportions and, by the sad time of the eventual collapse of the ancient Gaelic order, they had imposed an indelible mark on the nation’s story. 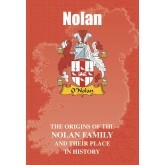 The proud tale of the Nolans is recounted here. NAME variations include: Ó Nualláin (Gaelic), O’Niallon, O’Nol..
Not only kings of the ancient province of Connacht but also High Kings of Ireland, the O’Connors have stamped an indelible mark on the pages of the island’s history. Their contribution to the national life came in the form of resistance to aggression, while many remained loyal in the face of adversity to the faith of their forefathers. The inspiring tale of the O’Connors and that of those who found a new life on foreign shores is recounted here. 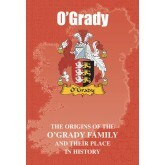 NAME VARIATIONS INCLUDE: Ó Conchobhair (Ga..
With origins steeped in the colourful myths and legends that form an integral part of Ireland’s long history, the O’Gradys were for centuries at the very heart of the island’s turbulent affairs. Proud of a descent from one of the Emerald Isle’s earliest monarchs, they managed to survive despite the frequent bloody outbreaks of rebellion that tore the island apart. Survivors to the last and truly living up to their motto of ‘Wounded not conquered’, the stirring tale of the O’Gradys and thei..